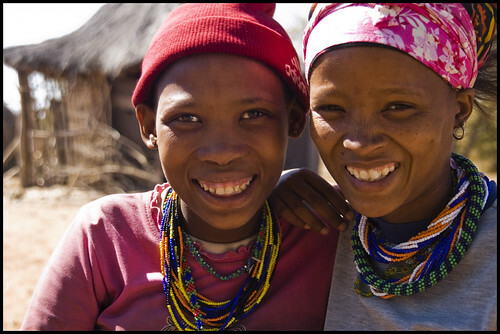 Two young girls from Kalahari, Namibia. I haven't read the article published in Science yet, so maybe I shoud withold my judgements... but any theory that makes claims about the specific characteristics of an ancestral language farther back than 10,000 years makes me brace for a lot of skepticism! The article in the Times says, "Quentin D. Atkinson, a biologist at the University of Auckland in New Zealand, has shattered this time barrier, if his claim is correct, by looking not at words but at phonemes — the consonants, vowels and tones that are the simplest elements of language. Dr. Atkinson, an expert at applying mathematical methods to linguistics, has found a simple but striking pattern in some 500 languages spoken throughout the world: A language area uses fewer phonemes the farther that early humans had to travel from Africa to reach it." Good discussion of the article is here. Also Language Log reviews it.